Your tax-deductible cash donation may be made online by charge/debit card or by mail with a check. Shop using Amazon Smile and AmazonSmile Foundation will donate 0.5% of the purchase price from your eligible AmazonSmile purchases to Gulf Coast Center for Nonviolence. 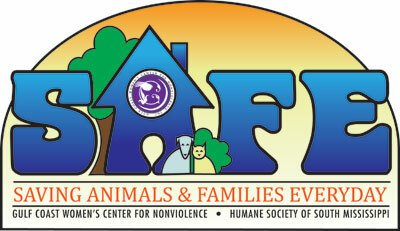 Used Clothing: Due to storage limitations the Center has an arrangement with Humane Society of South Mississippi. Please ensure you donate to the Humane Society Thrift Store on behalf of the Gulf Coast Center for Nonviolence and our women and children clients can shop for free. (See "A great way to show your support", below). Used Appliances and Furniture: Must be in good working order and have a clean, new appearance. May require a few weeks to schedule a pick-up. Christmas Family Adoption: We have many clients and families who need sponsors for Christmas each year. Please contact Kimberly Robertson at krobertson@gccfn.org or by phone at (228)436-3809 if you or your group is interested in adopting one or more families for Christmas. 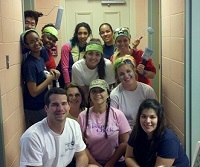 To see a description of our volunteer teams, check here or download one of our applications below. For volunteer inquiries, contact Charlotte Brown at cbrown@gccfn.org or call the Center at (228) 436-3809 (must be 18 yrs old to apply). This document must be submitted by the Volunteer Applicant for the application process to begin. Some placements, such as our crisis line or sexual assault volunteers, may need to submit additional documentation or complete background checks before being assigned to duty. These documents will be provided by the Volunteer Coordinator only if needed. Willing community members who are at least 21 years old may be trained to become sexual assault victim advocates. These special people make themselves available to be on call to visit victims of sexual assault in the hospital, provide support, and share information about available support services. If you are interested in becoming an SA Advocate, please contact Stephanie Piper at spiper@gccfn.org or (228) 436-3809. 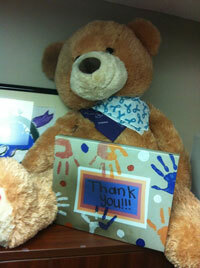 One great, fun way to help support our Center is to participate in our volunteer usher program. 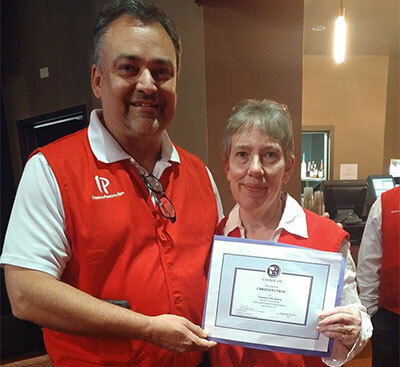 Through a cooperative agreement with IP Casino and Golden Nugget Casino, we provide volunteers to serve as ushers at their concerts, and they provide a financial donation for each show. We are always in need of volunteers. The work is easy and ushers get to see some great concerts for free! Watch our Events Calendar (in the sidebar) for upcoming opportunities, and contact Paul Ahlberg (paul.r.ahlberg.civ@mail.mil) for IP shows, or Dan Kazumura (daniel.kazumura@gmail.com) for Golden Nugget shows, to sign up prior to the show. Must be 21 or over to participate. The Center hosts many public events throughout the year, from our Walk A Mile In Her Shoes event for Sexual Assault Awareness Month in April, to our Purple For Peace campaign in October for Domestic Violence Awareness Month. These events are always fun, and we need you! Watch our Events Calendar, join our mailing list, or follow us on Facebook or Twitter to keep up with all our upcoming events. Are you part of a civic group, church group, club or class? Can you bring together a group of interested friends? Contact us to have a speaker come talk to your group about domestic violence or sexual assault awareness and prevention. It's a great way to spread awareness and help us get the word out about the services available at our Center. 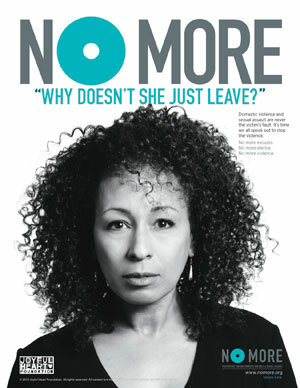 NoMore.org has a wealth of information, video PSAs, and graphics you can use to share information about stopping domestic violence and sexual assault. Whenever we have an event, or we have an immediate, specific need (e.g., a family is moving out of shelter and needs beds, or we have several babies in residence and we've run out of diapers) - our quickest way to reach out for help is through social media. Following us, re-tweeting and sharing our posts goes a long way toward helping us get the word out. 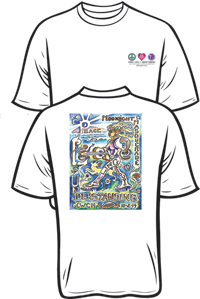 These special edition, high-quality white cotton tees are now available to commemorate Moonlight Masquerade 2014! 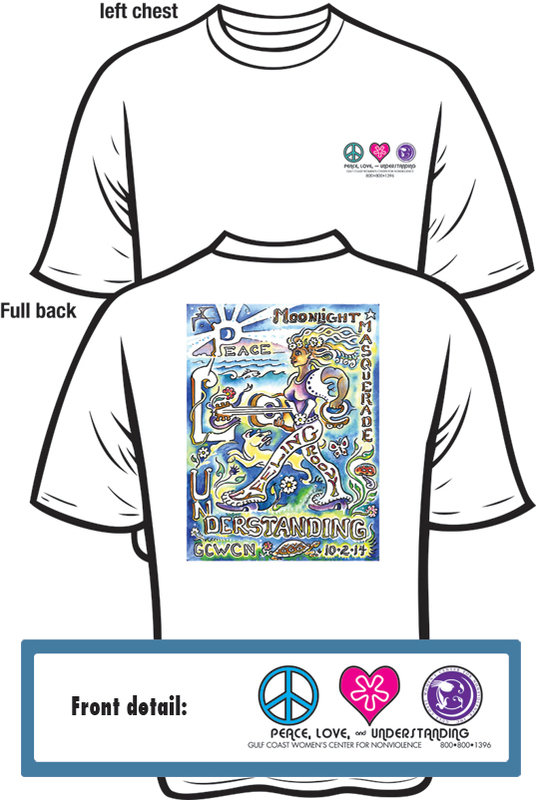 The front pocket area is decorated with the “Peace, Love, & Understanding” logos, while the back features our original “Feeling Groovy” art print designed by local artist Christopher Inglis Stebly.